Born in Siberia in the wake of the Russian Revolution, Esphyr Slobodkina's family settled in Harbin, Manchuria. In 1928, Slobodkina immigrated to New York City and enrolled at the National Academy of Design the following year. In 1931, through a peer, she became acquainted with Ilya Bolotowsky. The two shared an interest in the theoretical aspects of modern art-form, color, and composition. Slobodkina also formed relationships with Gertrude Greene, Byron Browne, and Giorgio Cavallon, and became immersed in city's avant-garde scene. In the early 1930s, Slobodkina and Bolotowsky were invited to the Yaddo artist colony in Saratoga Springs, and there the former began experimenting with abstraction. The two married in 1933, and Slobodkina produced her first Cubist work in 1934. In 1936, Slobodkina separated from Bolotowsky. Around this time, her family moved to New York city; alongside her mother, Slobodkina opened a dress shop and served as a textile designer and manufacturer. 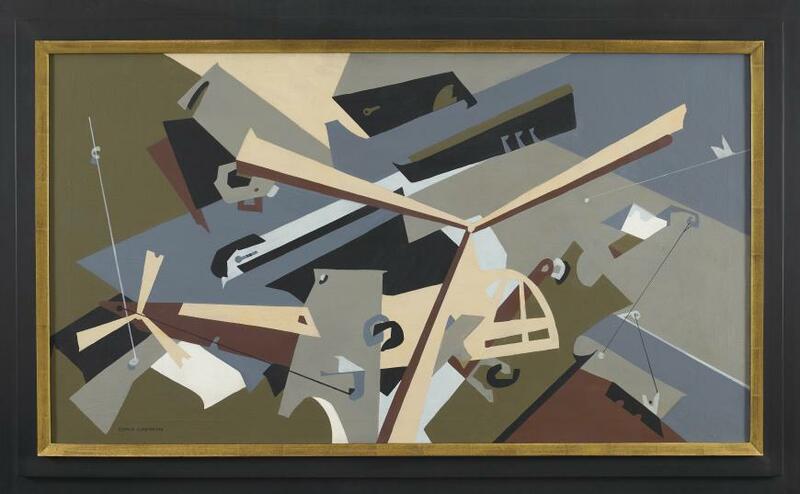 She joined the Works Progress Administration and became active in the Artists' Union, for which she began to design paper collage posters and in the process further develop her brand of abstraction. 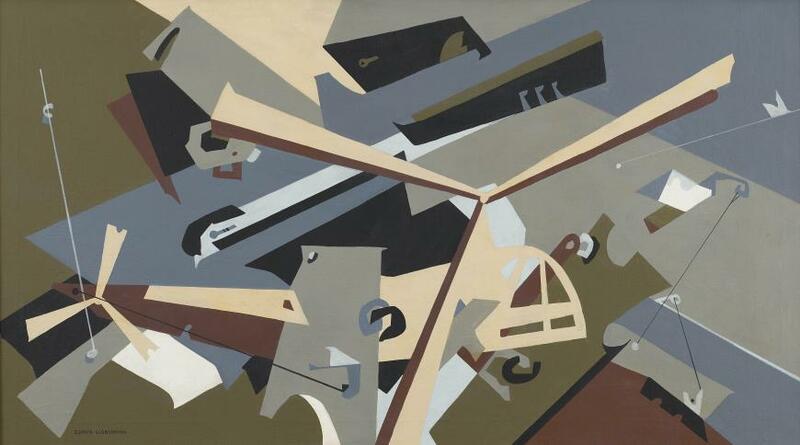 By 1936, she was a fully-fledged abstractionist, her works reflecting her experience in collage by way of their flat, layered compositional arrangements. In addition to her paintings, Slobodkina worked on Surrealist-inspired sculptures composed of wood, wire, and found objects. In 1937 she became a founding member of the American Abstract Artists, and would later become president. That same year, Slobodkina met famous children's book author Margaret Wise Brown and was inspired to try her hand at illustration. She illustrated Brown's The Little Fireman as well as her own Caps for Sale (1938), which went on to become a beloved piece of children's literature and was even adapted into a musical. Throughout the '40s and '50s, Slobodkina participated in a series of notable exhibitions, including "Eight by Eight: Abstract Painting since 1940" at the Philadelphia Museum of Art (1945) and the Whitney Museum of American Art annuals (through the 1950s). "There's a body, there's a wing structure…I don't believe in this Kandinsky floating stuff. I'm not a ghost…I'm still building structures…I'm very architectonic." One of Slobodkina's finest compositions, Levitator represents the pinnacle of the artist's career, and was painted during the decade in which she achieved an astounding level of critical success. Having exhibited in New York City in the 1940s, Slobodkina continued to show her work actively throughout the '50s. She participated in the Whitney Annuals of 1950, '51, '52, '53, '55, and '58; her 1952 entry Composition with White Ovals was subsequently purchased by the museum. Levitator bears the hallmarks of Slobodkina's mature style: bold, graphic forms-the artist described herself as an "Abstract Surrealist"-and a concentration on definitively mechanical and modern subject matter. Levitator is closely related to an oil on gessoed plywood work of the same title that Slobodkina created in 1950, after seeing and becoming inspired by the scraped-gesso paintings of John Ferren at the Museum of Living Art. This other Levitator is marked by areas in which the gesso is completely scratched off, exposing the texture of the bare plywood underneath. Slobodkina considered it the culmination of her style. Our oil on canvas Levitator dates to the same decade, and is characterized by a similar horizontal compositional arrangement featuring strong geometries and a masterful use of color. Dynamic tensions are created in Slobodkina's overlapping and interweaving of inventive shapes, and the effect is a futuristic machine-like abstraction that resembles the structure of an airplane. Her dramatic tonality and hard lines lend Levitator's flat forms a sense of dimensionality; complete with wings and propellors, Slobodkina's abstraction assumes the appearance of an aircraft ready to take flight.